No one knows exactly what David's harps looked like, but the Bible says that he played them, and very well. They were of great importance in his spiritual walk with God; inspiring him to write verses in Psalms. 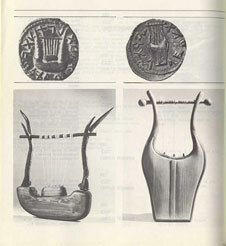 Drawings from coins and caves depict a crude yoke style harp much like the letter "H" with a solid bottom half. 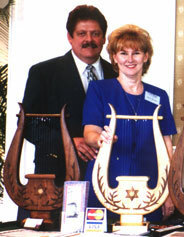 The traditional yoke-shaped harp can be traced back about 4,000 years through biblical archaeology. The pictures to the left show two harps reproduced in the likeness of the images found on Bar Kokhba coins that date back 2,000 years to what was known as "year one of the redemption of Israel" (from the Hebrew inscriptions on the coins) and were found in Israel. By the end of the 16th century, the harp became stylish, adorned with a variety of branches, stars, and jewels. Jubal was called the father of those who play the harp (Genesis 4:21). Harps in general had from 3 to 12 strings, the Bible speaks specifically about the 10-string harp (Psalm 33:2, 92:3, and 144:9). Although not fully understood, people today are experiencing the healing powers of the harp. Just hold this harp close to your heart,rest your face on the side of its arm, and feel peace and serenity surround you. The Talmud (a collection of Rabbinical teachings) taught that when the 10-string harp of David returned, it would mark the imminent coming of the Messiah. Today, the Lord is calling His people home to Israel, churches are heeding His call to rebuild David's Tabernacle (Amos 9:11 and Acts 15:15-16), and David's 10-string harp has made a prophetic return after 2,000 years, to sing the songs of Zion once again! This harp was chosen and anointed by God for a key role in the world that is to come, and in the redemption of man.